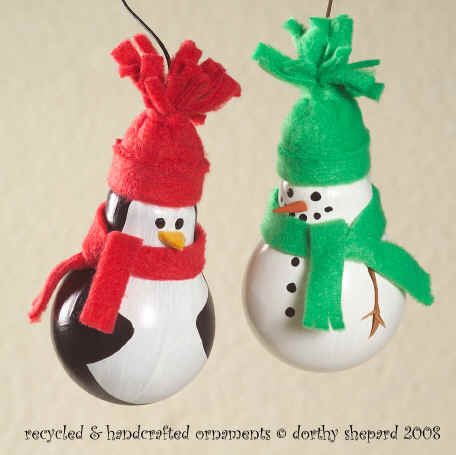 "Merry and Bright - Recycled Light Bulb Ornaments"
Merry is the Penguin and Bright is the Snowman. The idea to make these ornaments came to me when I began changing to compact fluorescent bulbs in my home. I hated the idea of just throwing the bulbs away. I used to make larger versions of the hats as gifts for the babies I cared for in my home. This project is easy but it does require several steps. I usually make several at a time. All of the materials used are easy to find at craft, discount and fabric stores. They make great gifts and are worth the effort. You can even personalize them! Start with a clean, burnt-out light bulb. I use a little glass cleaner on a rag and clean them off, but water works fine, too. Paint entire bulb with white acrylic craft paint. The penguin will need two coats, the snowman three. The penguin then gets a coat of black to give him a "tuxedo." I use black paint to add eyes, buttons and coal. Brown paint is used for the "twig" arms on the snowman. I then coat the entire bulb with a clear acrylic top coat. Make sure you let your bulbs dry very thoroughly between each coat of paint and before assembly! The hats and scarves are made from polar fleece. You can buy the yardage at a fabric store, but lone fleece mittens or outgrown fleece clothes work well, too. For the hat you'll need a tube about 3 1/2" in diameter and 3" long, but make a test hat. Light bulb brands vary a bit in size. The hat is sewn lengthwise, turned inside out and then small strips are cut from end, 1/3 of the way down, to create the pom-pom. A thin scrap of fleece 4" in length is needed to secure the hat. The scarf can be any size. Try a couple different lengths and widths to get the look you prefer. I used felt for the penguin beak and the end of a skewer painted orange for the snowman nose, but be creative - a lot of different things could work to finish the faces and make cute expressions! You can now assemble your snowman. Fix the hat in place with a small amount of craft glue under the brim and on top of the bulb, and then tie it in place to secure and to finish the pom-pom. You can use the extra length from the tie as a hanger, make a simple wire one as I did, or you can add an inexpensive wire or ribbon ornament hanger. 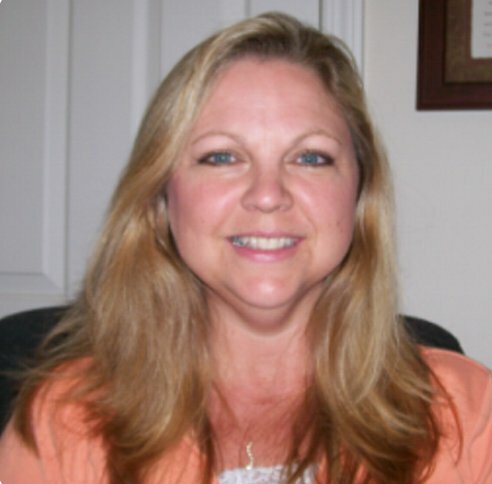 Copyright © 2010 by Dorthy Shepard. All rights reserved.